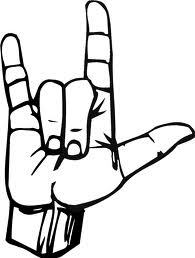 Children’s Sermon idea for Valentines Day / Sunday: Show the children how to say “I love you” in sign language. (One handed (see above) or Point to yourself (I), Cross your arms across your chest (Love) and then point to the other person (You). Show them a cut out paper heart with the words “I love you” written inside. Explain how we could also give a Valentines heart to people as a way of telling them we love them. Remind them how God showed his love by sending us his son Jesus. Remind them that it is important to tell people closed to us that we love them. Full Valentines Day message: Good morning children! What special day does this heart remind you of? That’s right- Valentines Day. Saint Valentine was a real person who showed his wonderful love by helping people in need. Valentines Day is a great day to tell people how much we care about them and love them. This morning I want to show you a very interesting way of saying, “I love you.” I’ll show you how to say “I love you” in sign language. (Get the children to copy the hand motions for “I love you.” You could also show them the one handed method (Hand outstretched with 2 middle finger folded down.) What are some other ways we can tell people we love them? (Discuss the importance of demonstrating love and telling people with love them.) Those are all very good ideas. (Hold up a red paper heart) When I was young we would sometimes hand out red Valentines Day hearts to people. It was a simple way of telling people how much we cared about them. Do you see these words here? This says, “I love you.” There are many ways of showing people our love. Valentines Day is a good day to tell people and show people we love them. God showed his love to us by sending his son Jesus. It’s important that we pass on that love to others too. Children’s Prayer: Thank you for St. Valentine who showed his love by helping people in need. Help us to show love to others by our words and by our actions. In Jesus’ name – Amen!